Every type of window has its own unique set of merits. 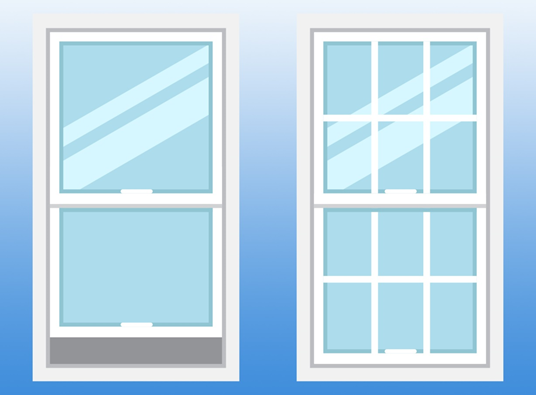 In this post, Kroll Construction puts the spotlight on double-hung windows by discussing their features and benefits. If it’s time for wood window replacement in Detroit, MI, consider double-hung windows. This type is a classic in the world of windows and is a staple in many American homes because of its simple design. In addition, double-hung windows provide controllable ventilation, as you can opt to open only the top or bottom sash, or both. Opening both sashes improves the quality of your indoor air and naturally makes your home cooler, as fresh air is drawn in from the bottom and stale indoor air is expelled from the top. This type of window is also easy to maintain; since most double hung windows have tilt-out upper and lower sashes, you can clean your unit from inside your home. If you are considering wood window replacement in Detroit, Michigan to gain a more contemporary unit, then consider slider windows. These are sleek and feature a large expanse of glass, making them the perfect addition to modern homes. Slider windows are also low-maintenance and cost-effective because they have fewer parts than traditional windows. The springs and pulleys found in other windows may wear or fail over time, and since slider windows don’t rely on these components to function, they last longer than conventional units. Many homeowners prefer slider windows because they’re easy to operate– all you need to do is release a latch and slide the window open. In addition, they are relatively light and they glide along the window frame with ease. Both types of windows let an abundance of natural light and fresh breezes into your home. They are perfect to install in your living room or kitchen, as they set the perfect ambiance for cheerful chats and meaningful gatherings. Let Kroll Construction help you choose the ideal type of window to install in every part of your home. Call us today at (888) 338-6340 to schedule a free estimate.